Can You Find the Third Moon in this Glorious View from Saturn? 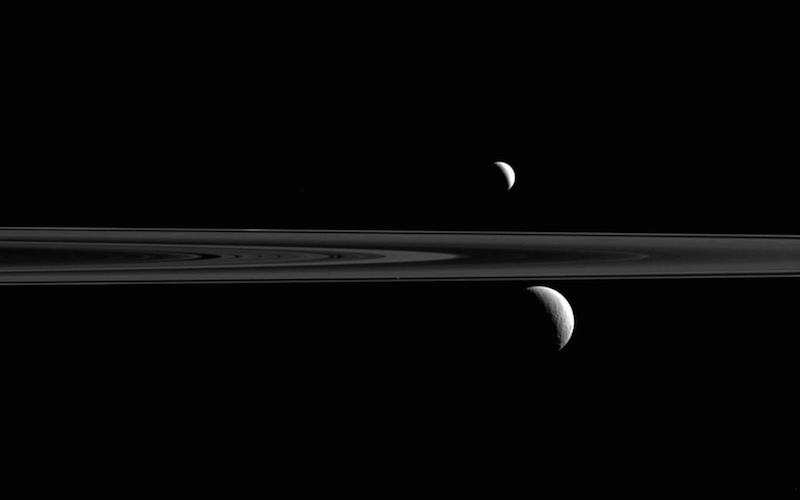 We know the Cassini spacecraft around Saturn took this photo of a trio of moons. Rhea and Enceladus are easy to spy bracketing Saturn’s rings. So fess up: Which one of you stole Atlas? The Cassini spacecraft snapped this photo on September 24, 2015 when it was between 1 and 2 million miles from each of the moons. But the subsequent difference in scales isn’t the only thing hiding Atlas from sight. The moon is just 19 miles (30 kilometers) across, downright minuscule compared to the heftier Rhea (949 miles or 1,527 kilometers diameter) and Enceladus (313 miles or 504 kilometers diameter). If we start working through the relative sizes and distances, Rhea takes up 95 pixels across and Enceladus just over 60, but poor little Atlas is just 2 pixels in diameter. No wonder it’s hard to spot! After over a decade of science, the Cassini spacecraft is currently on its farewell tour of the Saturn system. It will be performing ever-more daring feats of orbital dynamics this year in the lead up to its final plunge into the gas giant in 2017.